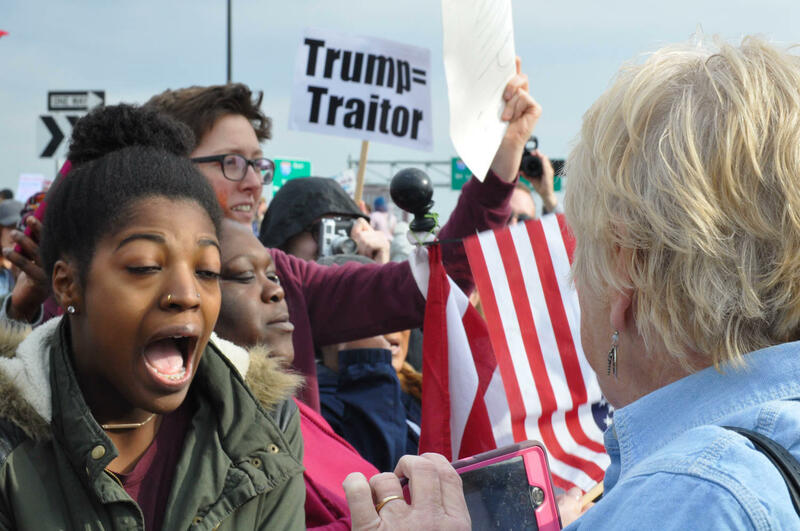 Supporters and opponents of President Donald Trump clashed for several hours outside of the St. Charles Convention Center where he spoke Wednesday afternoon. Police intervened several times. 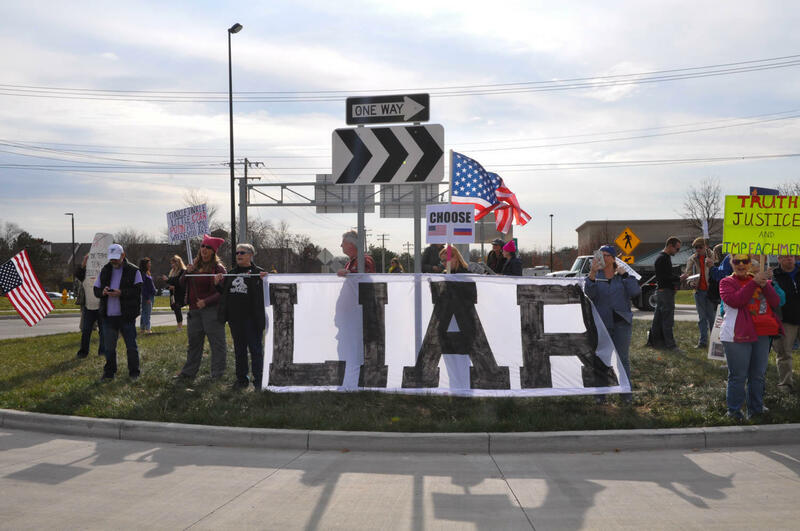 Opponents of President Donald Trump held signs near the convention center entrance where they expected his motorcade to pass by. 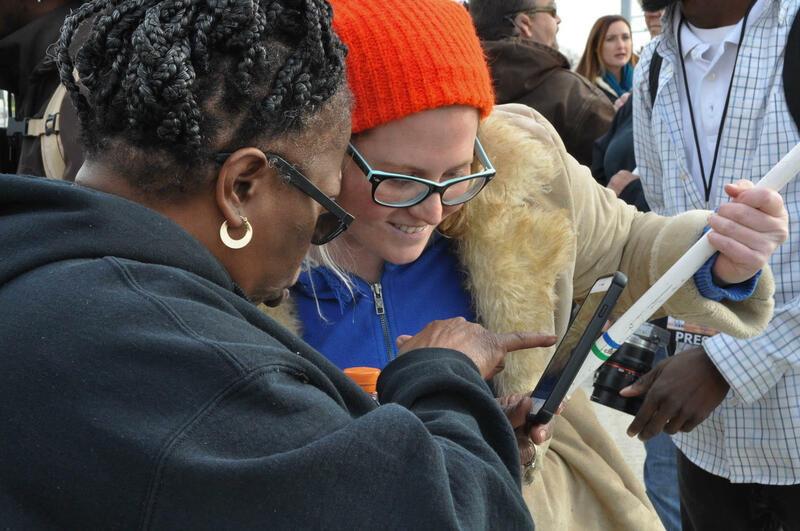 Christie Dean, of St. Peters, said she came to decry Trump’s behavior and harsh rhetoric, which protesters outside the convention center say has sparked a wave of hostility against immigrants and refugees, minorities and transgender people. “I am here because I want it known that a fascist is not welcome in my town,” said Dean, who brought along her two children. 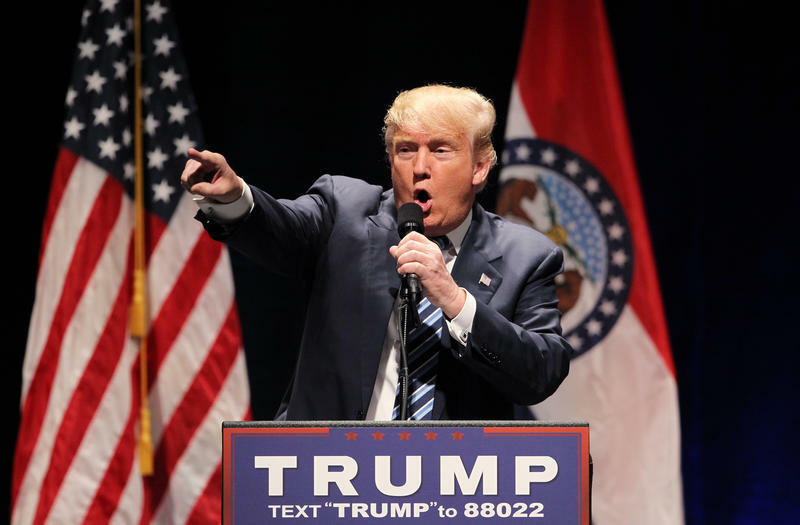 “My kids know who Trump is and that they are not allowed to behave like him." “America is greater than this," said Dean. She also criticized the tax plan Trump and Republican leaders in Congress claim will have widespread benefits. 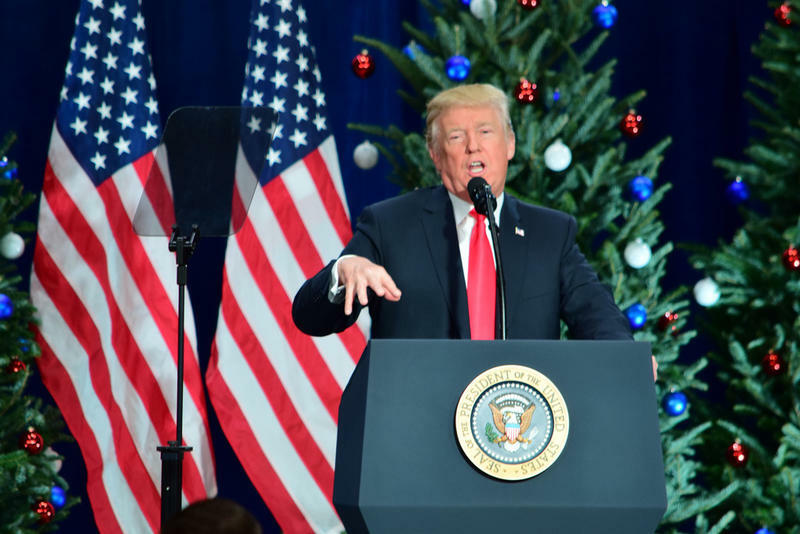 Supporters of the president were quick to counter that characterization. 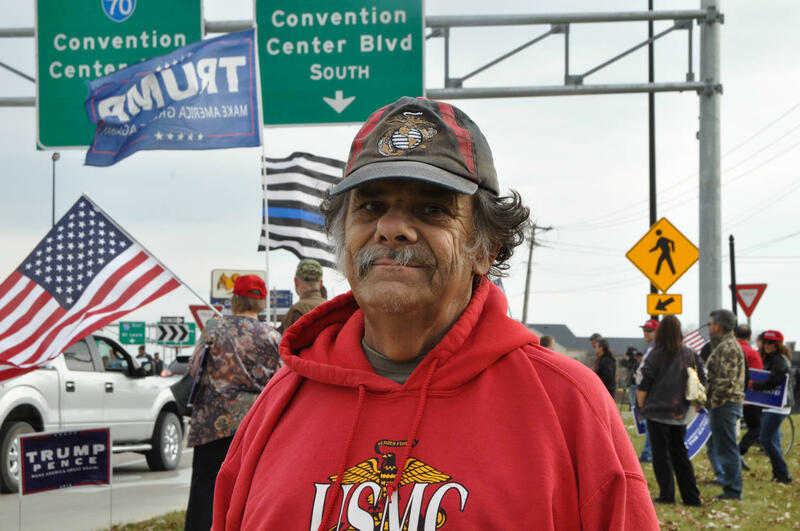 Dallas Vick, a Vietnam veteran, came to the convention center in support of Trump. Dallas Vick, a Vietnam veteran who came to the convention center with his dog, Tyson, said he was very concerned about veterans’ benefits. “I thought Obama was going to take away the Veterans’ hospital,” Vick said of Trump’s Democratic predecessor. Since assuming the presidency nearly a year ago, Trump has sought to overturn many of Obama’s measures. But Vick also spoke to the nation’s partisan divide, one in which many people have an intense distrust of the opposite political party. Much of the activity in St. Charles is emotionally charged. Throughout the afternoon Sandra Mutert, right, responded to protester chants by yelling "My president! My President!" In response, supporters of the president tried to get their message heard. “My president!” yelled Sandra Mutert. Mutert said two of her children are police officers. 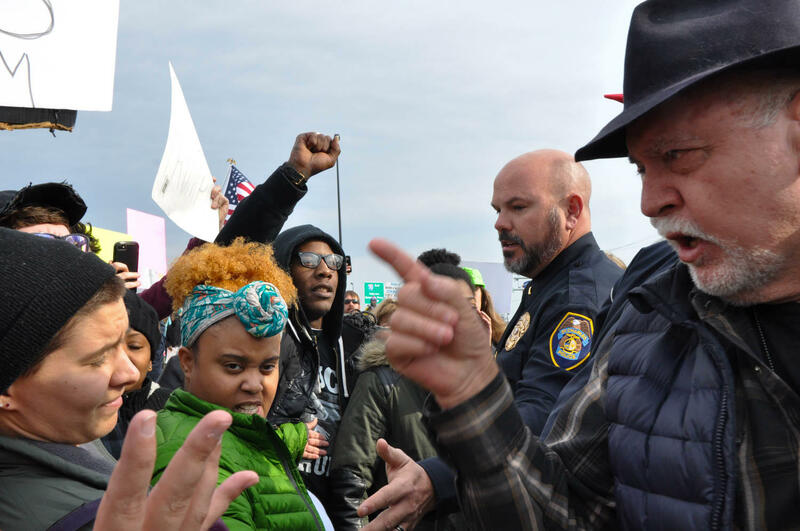 When confrontations between competing protesters became heated, police officers stepped in to defuse them. The prevailing message came from Thomas Payton, a retired St. Louis firefighter. But the opportunity for at least some dialogue wasn't entirely lost. Cat Daniels, left, opposes Trump, but initiated one-on-one conversations with a number of his supporters, including Kathie Stussie, right. 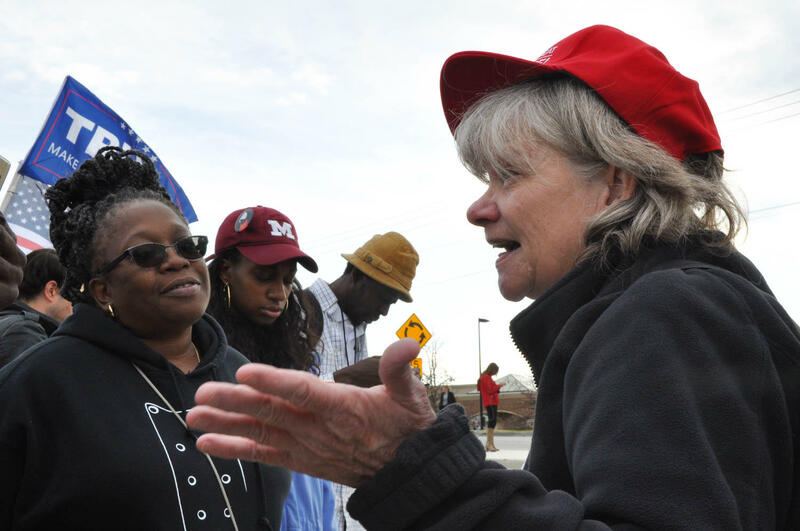 In the middle of a crowd of chanting and heated arguments, Cat Daniels, who is black and opposes Trump, quietly initiated one-on-one conversations with a number of Trump supporters. “I’m here because I wanted to talk to people. I want to bridge gaps. All the ugliness? I’m not here for that,” Daniels said as she spoke with Susie Brown, a Trump supporter. Brown, who is white, lives near the convention center and was excited to see the president’s motorcade as it passed by. Cat Daniels, left, shows Susie Brown, right, photos of her children explaining why she especially prays for the safety of her sons everyday. The two talked intently for about 30 minutes. Daniels pulled out her phone to show pictures of her children to Brown. Daniels explained that she especially worries for her sons. Brown nodded, keeping eye contact with her. Though they didn’t change their different opinions of the president, Daniels invited Brown to join her as she cooks and delivers meals for neighbors who need them on Thursday. After they exchanged numbers, Brown promised to come along. “God answered my prayers in bringing you out here today, Cat,” Brown said as she entered Daniels number in her phone.